PRESIDENT MICHAEL D Higgins has said a visit by his wife to imprisoned peace activist Margaretta D’Arcy was “private and personal” and that the issue of whether or not it was appropriate “doesn’t arise”. The 79-year-old, who is undergoing treatment for cancer, was arrested at her home in Galway last week after she refused to sign a bond to keep away from unauthorised zones at Shannon Airport. She’s now serving a three month sentence in jail. 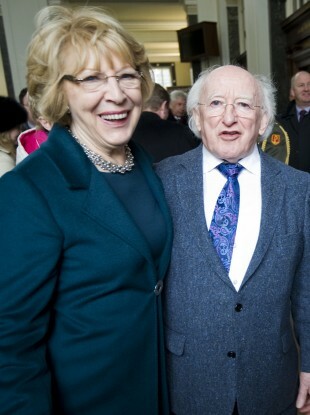 It emerged yesterday that Sabina Higgins had paid a visit to her in prison. “Sabina was visiting a friend of long standing whose health is frail and who is a fellow artist,” the President said. “Sabina is a person who can speak for herself and is a person of very good judgement, and we do a lot of other things as well. Speaking earlier, Tánaiste and Labour leader Eamon Gilmore said that there was nothing inappropriate about the visit, and described the veteran campaigner as a “strong woman with strong convictions”. Fianna Fáil’s Michael McGrath was also asked about the issue and said that it was the right of any citizen in the State “to make a private visit to a prisoner held in this State in whatever way they see fit”. Asked whether she should be released, McGrath said it was a matter for the the judiciary and the Prison Service, and that no politician could interfere in such decisions. Around 150 people turned out for a protest calling for the activist’s release at the Department of Justice in Dublin last Friday, with smaller demonstrations taking place in Galway and Limerick. Speaking at the weekend, Sinn Féin leader Gerry Adams called for her immediate release, saying that the writer and film-maker is “not a criminal and poses no danger to the public”. D’Arcy had initially been given a suspended three-month jail term for trespassing at Shannon, but the sentence was activated after she declined to sign the court bond last week. She had been protesting the use of the airport by the US military. Email “President defends Sabina prison visit as “private and personal””. Feedback on “President defends Sabina prison visit as “private and personal””.